I have maintained in the past that Hove has the finest mews roads in the country – and they come in all shapes and sizes as I spotted in a recent Austin Gray auction catalogue. We all know Poets’ Corner and, as has been adopted more recently by local estate agents, the nearby Artists’ Corner. But the area between Sackville Road, Goldstone Villas, Clarendon Villas and the railway has yet to be named. It appears to have once been called the “Hove Drove Estate”, which makes sense as Sackville Road was once called Hove Drove (a drove was a road along which sheep were walked). This vibrant spot contains a number of inconspicuous entrances, behind which there are totally hidden buildings and miniature streets. The Austin Gray property, which is still for sale, is an entire mini-mews that includes, and is accessed through, a house that fronts Shirley Street. The road gets its name from the Shirley family who once lived at Preston Manor, and who owned land in Preston and Hove that became the Stanford Estate (which included the Avenues). It was the Stanford family that sold the land to developer George Gallard (the “George” in “George Street”) in 1872. Shirley Street, and the rest of the Hove Drove Estate, were developed in the 1870s. Each of the roads in the area is made up of row upon row of terraced houses. Yet every now and then there is an archway in the terrace; wide enough to accommodate a car (or, more to the point, a horse and carriage). Some lead to a simple outbuilding behind. 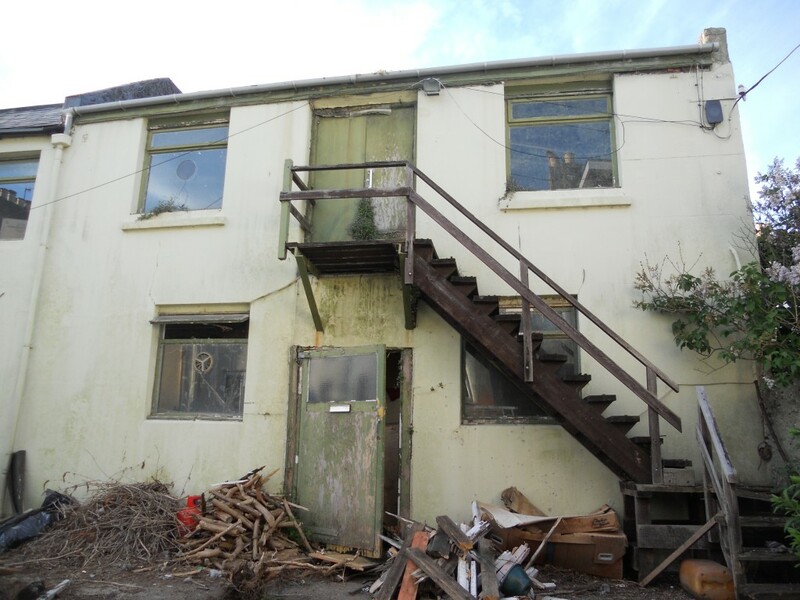 In the case of 81 Shirley Street, an archway leads through to 81a which consists of four completely derelict workshops/offices. Ceilings are collapsing, stairs are cracking and bags of post are piling up. Previous tenants appear to have been artists and a photographer. The enclosed structures are crying out to be brought to life again. If only the right buyer would come forward to propose something suitable for this potential oasis. 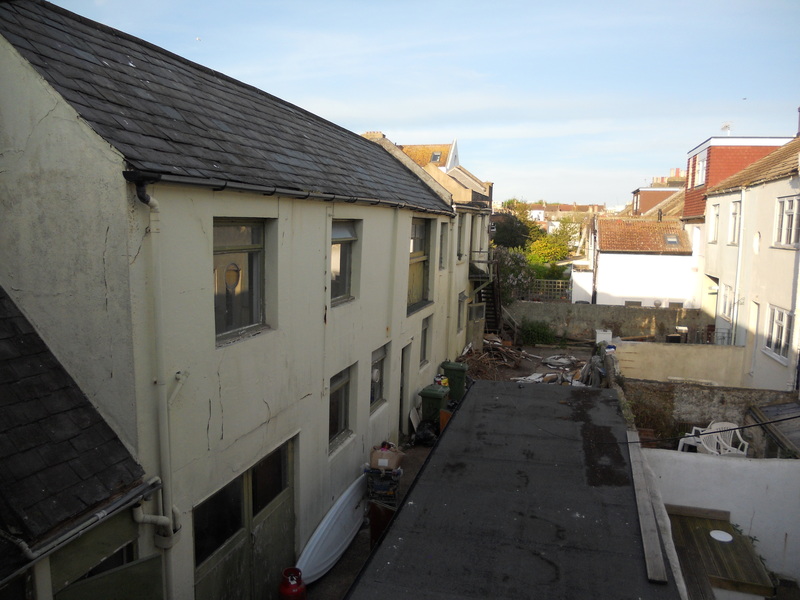 The obvious mews in Hove are Cambridge Grove, Wilbury Grove and those between the Avenues. In, Brighton, Kemp Town is full of them. But there are other hidden spots around the city. 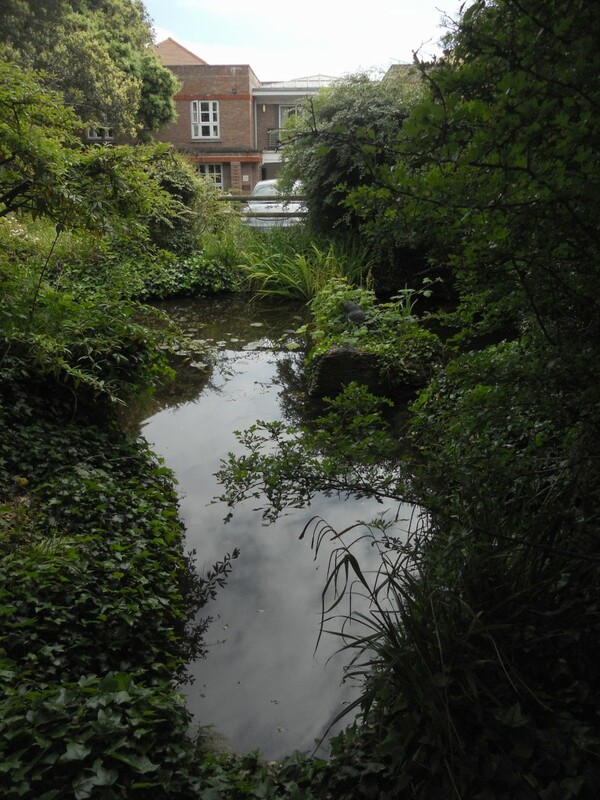 I can think of at least four examples in the Fiveways area – one of which probably began as a market garden, and now contains one of the city’s finest courtyard gardens. Hot on the heals of Artists Open Houses is Eco Open Houses – where architecture fans don’t have to pretend to be into art to look around interesting buildings. 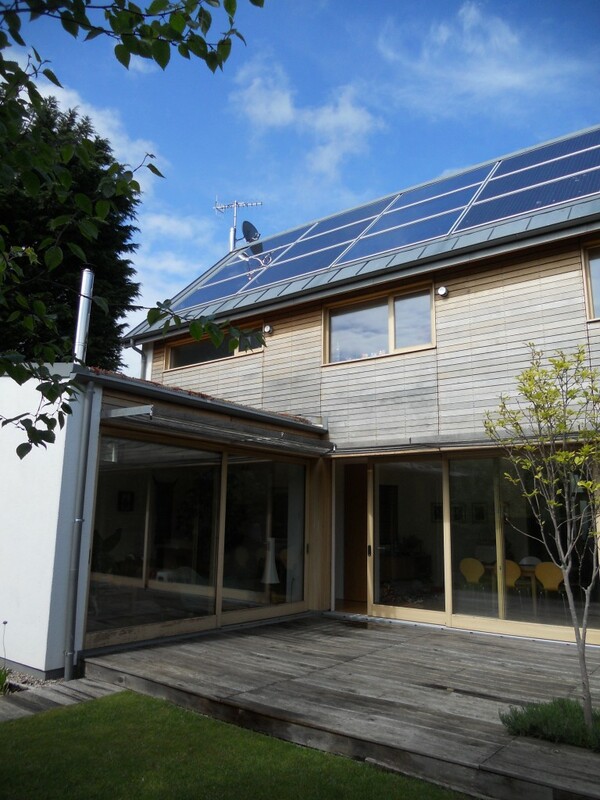 The purpose of the annual event, which spans two weekends in June, is to demonstrate the advantages of eco buildings to the public and share best practice amongst those who are already in the know. There are 21 properties on the list this year, several of which I have written about previously, including 15 Lloyd Close. Tucked away in leafy Hove Park, and built over what was the rear of the rear garden of a large house on Shirley Road, 15 Lloyd Close is the futuristic home of architect Mark Pellant. I actually first visited when it was still under construction but too late to see its timber frame. There is a certain purity to this house whereby the eco theme runs through everything, including the delicious garden. Some of my favourite plants feature including silver birch and euphorbia. It was actually this exact garden that inspired me to take up gardening as a hobby. I recall discussing the various fruit trees just after they had been planted (apple, pear and plum if I remember correctly). As one might expect, there is a huge tank beneath the patio that collects rain water for the toilets and washing machine. The zinc roof neatly incorporates an array of 15 solar panels – 12 photovoltaic for electricity and 3 solar thermal for the heating. When I last visited, efficiency figures weren’t available as the buildings was still in its first year. Mark just told me that the house now actually makes him money. He sells £1,500 of electricity to the grid each year and takes just £500 out (plus £500 on pellets for the boiler). 15 Lloyd Close is perhaps my favourite of the 21 houses. To be avoided though is the incredibly unwelcoming 148 Hartington Road which is one of those dreary white boxes. It’s at the top of a massive hill and subject to erratic opening times. In the past, I have written about the Smart House on Ditchling Road by Alan Phillips Architects, 20 Avondale Road by Oliver Heath, Yew Tree House by Bill Dunster and 40 Varndean Gardens by BBM. I can’t recommend each of these enough. Eco Open Houses takes place on the weekends of 15th/16th and 22nd/23rd June. See www.ecoopenhouses.org. 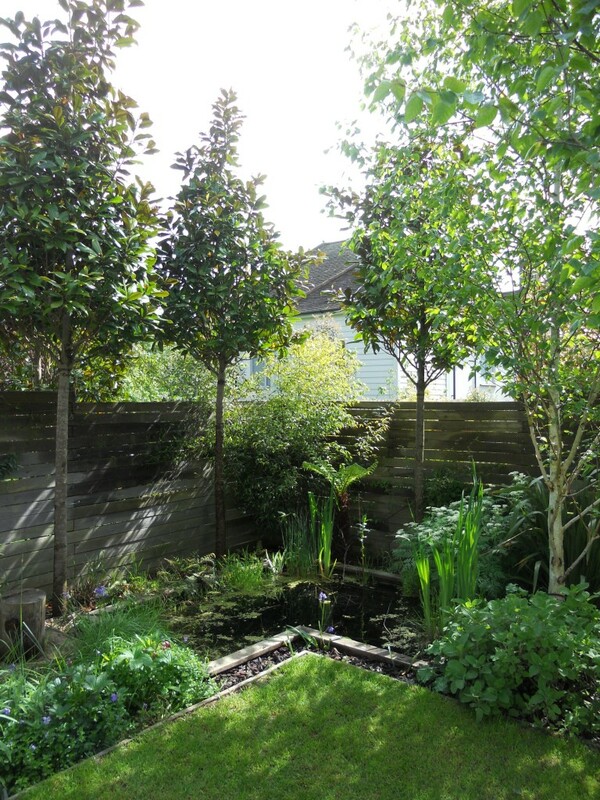 I’ve seen a few hidden gardens around Brighton & Hove over the years. The most intriguing is perhaps that which is accessed via tunnel from Portslade Manor. 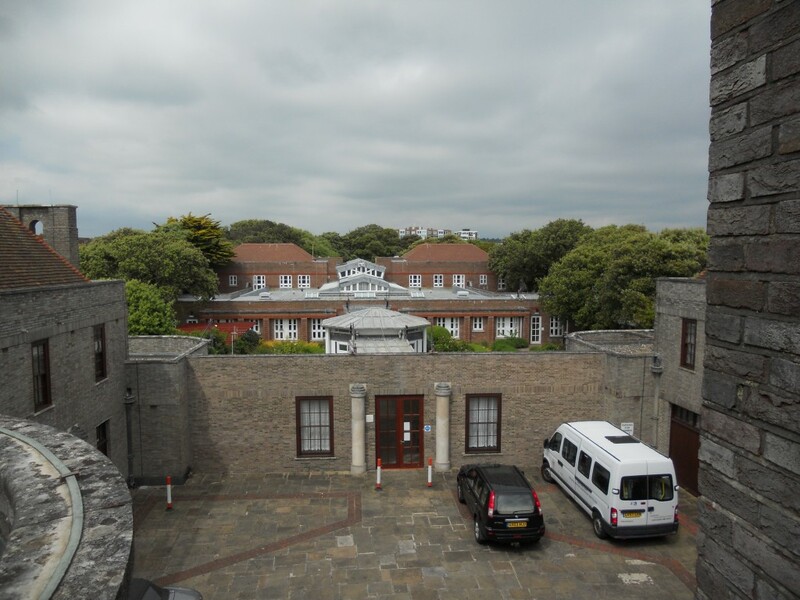 But Brunswick Square, Sillwood Road, Marine Parade and Bristol Place all offer exciting alternatives. When I was first introduced to the forgotten area behind St Leonard’s Church on New Church Road, I knew straight away that it had huge potential for something special. The secluded spot exists in a built-up area, yet is totally hidden by trees, fences and graves. It was never consecrated which meant, with agreement from Father Stephen Terry, that my fellow volunteers and I had an entirely blank canvass – in which to get muddy. The history of the church itself is somewhat extensive. A ‘new’ church was certainly built on the site in 1150 but it may well be that another existed before 1066. A smaller replacement structure was erected during the 13th Century. This fell into disrepair over the years and was rebuilt from 1876. A fire in 1906 led to more work taking place over the ensuing years. I particularly enjoy looking at the flint walls to determine the different construction times. A combination of whole flints, broken flints, knapped flints and knapped and squared flints makes this a particularly enjoyable exercise. The churchyard was enclosed in around 1880 and apparently its north-west corner, the location of our ‘Secret Garden’, was home to a collection of sarsens (sandstone blocks). These stories make our work to transform the space into a community allotment a little like an episode of Time Team. We have so far unearthed a variety of church-related masonry (including pieces of graves and a memorial tablet to a Hazel Mary Theobald) along with old paths and flowerbeds. The general plan is to reinforce the hidden nature of the space by repairing gaps in the hedges and tree coverage around it. Raised beds are being built to the designs of my friend Oliver Borrow, an accomplished local garden designer. Preparation is the key though. 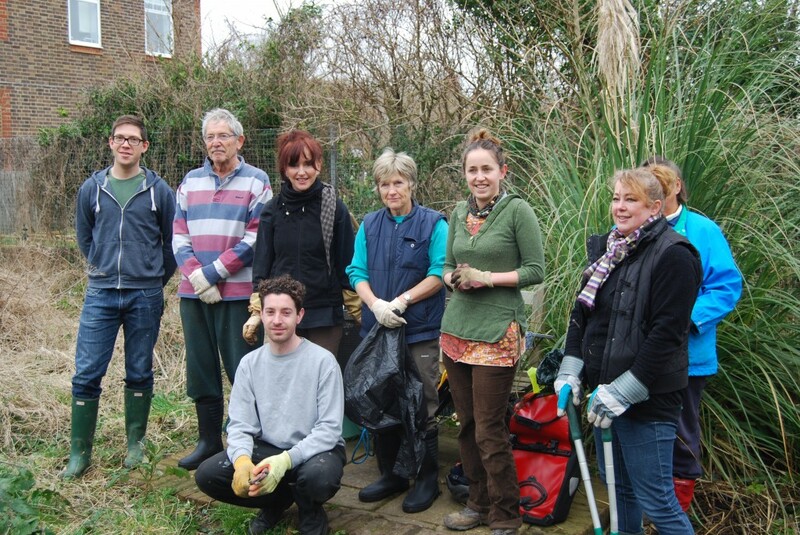 The committee (which includes Jane Eleini, Joi Jones, Mike Sharman and me) and a dedicated group of local volunteers have been clearing unwanted plants and rubbish for several months. We are there every Saturday from 11am and an Action Day is planned for Tuesday 18th June. If you are good at keeping secrets, and enjoy gardening, please come along and see us.